AC Milan goalkeeper Dida has had his ban following the Champions League game with Celtic in Glasgow halved by Uefa to one match. He had been found to have breached Uefa's principles of "sportsmanship and integrity" for over-reacting to minimal contact by a fan on the pitch. But Dida will miss only Wednesday's game against Shakhtar Donetsk. Milan had appealed against the original two-match ban. Celtic were fined £12,500 following the incident. 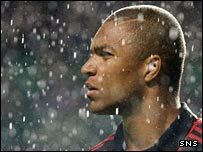 A statement on Milan's official website read: "Uefa has partially accepted Milan's appeal by reducing from two to one the match ban given to Nelson Dida following the episodes in Glasgow. "The Rossoneri goalkeeper will not be available for Wednesday's game at the San Siro against Shakhtar Donetsk, but he will be available to play in Donetsk on 6 November." The 34-year-old Dida was tapped by the fan who had invaded the playing area but then slumped to the ground dramatically and was stretchered off. Milan vice-president Adriano Galliani was satisfied with Uefa's ruling. "I believe it is fair - I was against the two-game suspension but one seems OK," he said. Dida stood in the centre circle and bowed to each corner of the ground before Sunday's 1-0 defeat by Empoli to say sorry for the incident. The Celtic fan who ran on to the field was banned for life by the Scottish champions.